Prototype: German Federal Railroad (DB) half dining car, 2nd class compartment car with a dining car buffet area, type BRbu4üm-61, (later the type RBbumh 282). UIC-X design (m cars). Model: The car has the chrome oxide green color scheme of the prototype from 1962 on. Realistically detailed trucks with a reproduction of the brake shoes and the generator mechanism. Unlighted red marker light inserts at the ends of the car. This car can be retrofitted with the 7319 plug-in current-conducting couplers or the 72021 working close couplers that can be uncoupled, and it is ready for installation of interior lighting. (2 x 73400/73401) Minimum radius for operation 360 mm / 14-3/16. Length over the buffers 28.2 cm / 11-1/8. DC wheel set 4 x 700580. Express Train Travel during the Economic Miracle. After the 1950s gave the German Federal Republic (West Germany) an economic upswing and the most important, private basic needs had been covered, many West Germans had a desire to travel. Yet, before the great growth in automobile ownership, the demand was growing for another series of modern passenger cars for long distance express service. The number of new design express train passenger cars placed into service since 1954 was no longer sufficient for this purpose. The DB therefore placed additional modern express train passenger cars into service from 1963 on. The following express train passenger car types belonged to this family of new cars: A4um-61, 1st class (later the type Am 203), B4um-63, 2nd class (later the type Bm 234), AB4um-63, 1st/2nd class (later the type ABm 225), BRbu4um-61, half dining car, 2nd class (later the type RBbumh 282), and BD4um-61, half baggage car, 2nd class (later the type BDms 273). The designs for these cars followed for the most part the concept for the first postwar car types of 1953/54, but folding doors were used for the entry doors on the sides of the cars. Externally, the sliding windows with bright gold oxidized lightweight metal frames attracted attention also. The interiors experienced a series of changes in details. In addition, sliding doors were built into the ends of the cars. 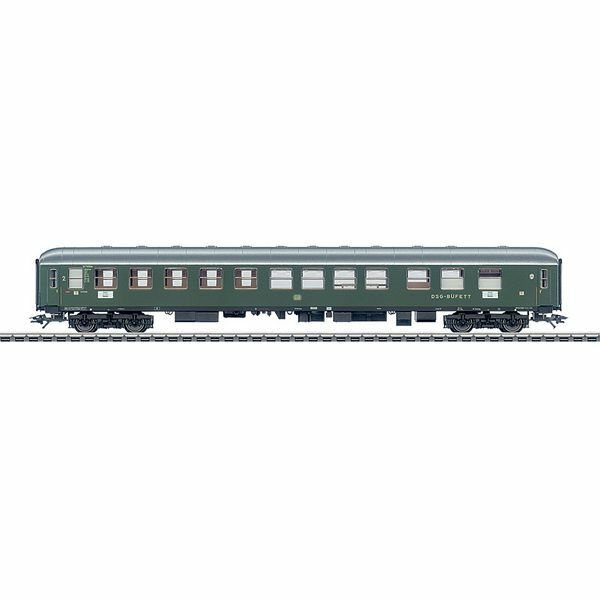 The 1st class cars with a cobalt blue paint scheme clearly stood out from the 2nd class cars and baggage cars in their chrome oxide green schemes. These consists were among the typical Era III trains used by the Economic Miracle children, who had just arrived into a modest prosperity, to travel during their vacations. This car can be combined with the 43910, 43920, 43930, and 43950 car models to make up a typical Era III express train car consist.